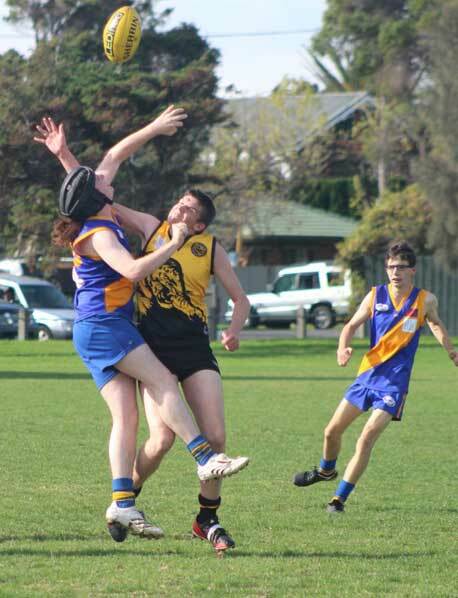 There were three FIDA games at the Fearon Reserve in Williamstown on Sunday 25 May and the reserves game was a beauty. The home team had a handy lead after the first quarter, courtesy of kicking with the wind to the Botanic Gardens end. The Wyndham Tigers then took advantage of the breeze and by half-time the game was anyone’s. Williamstown held the visitors scoreless in the third quarter but didn’t create enough of a buffer. Up for the ruck in the reserves. Photo by Col Newcombe. An early goal to the Seagulls at the start of the last quarter looked ominous but then Wyndham, with the breeze at their backs and cheered on by vocal supporters, including many of the senior team earlier beaten by nine goals, stormed home. They peppered the goals to kick 4.7 and win by seven points. The even spread of goalkickers for Williamstown reflected a team very much in form. The Tigers’ senior players may have a tough time of it on the training track this week, ahead of a home game against Kananook. A third game, a scratch match between Division 3 North Footscray and Williamstown thirds, was played in a terrific spirit. 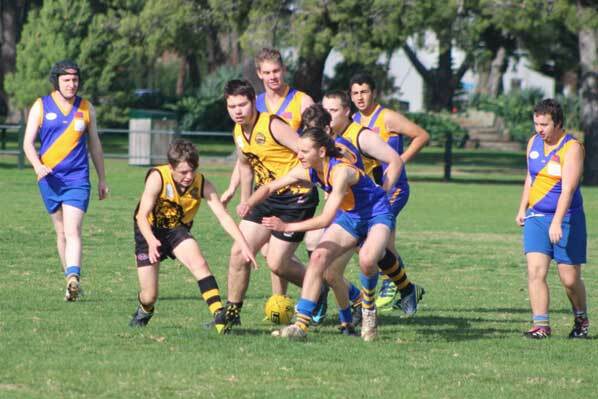 Although North Footscray had far too much pace and experience they were generous in victory, making sure their opponents had chances to get involved in the game. Williamstown best: Ray Causon, Josh Knight, David Henderson, Ray Warren, Kelvin O’Connor. FIDA reserves action. Photo by Col Newcombe.